Earlier I noted that the presence of ammonia on Ceres was evidence that the dwarf planet formed further away from the Sun than it is now. 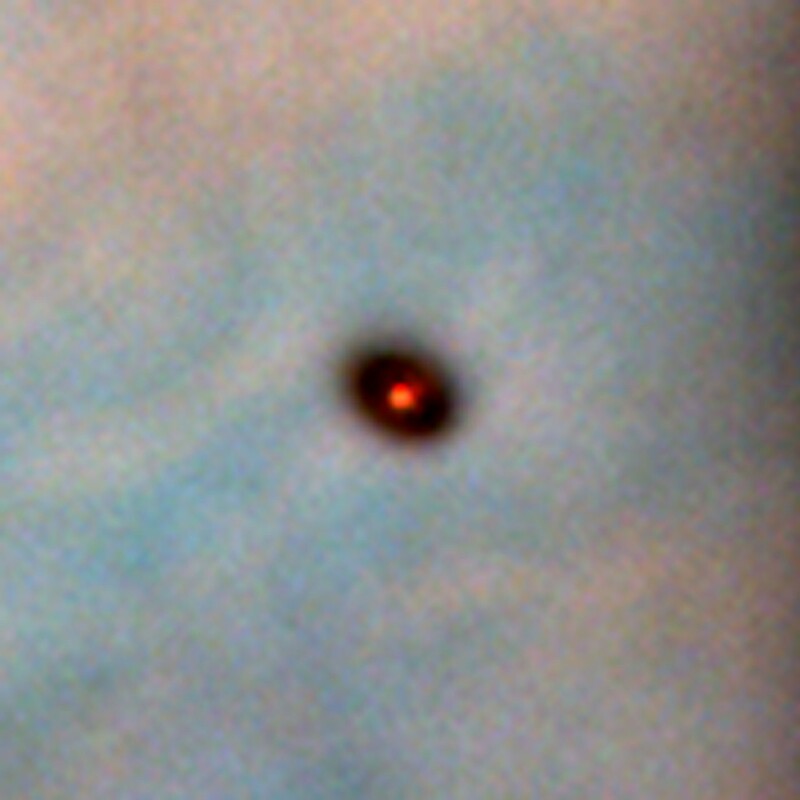 The reason for that is that the material surrounding a young protostar varies significantly by distance. A young star surrounded by a protoplanetary disc. The basic structure of a young solar system is that of a protostar surrounded by a protoplanetary disc. As the young star begins to shine, the surrounding disk is heated. Naturally, the material closer to the star gets warmer than the material farther away. In the close region, volatiles such as water and ammonia are broken apart or pushed outward by solar wind. As a result, material in an inner solar system will tend to be more dry and rocky, while the colder outer region will be more wet and icy. Dividing these two regions is a frost line or ice line. Closer than the frost line material is too warm for ice to form. Farther than the frost line ice can form more readily. In the current solar system, the frost line is at about 5 AU, which is a bit closer than Jupiter, so currently all the rocky planets are inside the frost line, and all the gas giants are beyond the frost line. This would seem to imply that it’s the frost line that determines whether a rocky or gas planet will form. But we now know that things are more complicated than that. 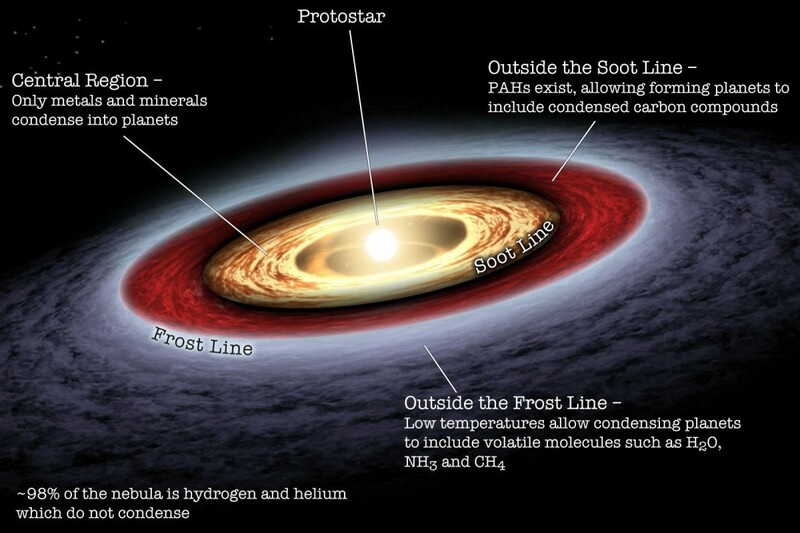 For one, the frost line in the early solar system was only about 3 AU, since the gas and dust of the protoplanetary disc absorbed light, keeping outer regions cooler. For another, we know that different planets form at different rates, and they can migrate during their formation. Large, Jupiter-like planets tend to form early on, and they tend to drift inward as they form. Our solar system with its inner rocky planets and outer gas planets seems to be more the exception than the rule. It does seem that large gas planets will tend to originate beyond the frost line, and this may in fact mean that asteroid belts will tend to form in the region near the frost line. As larger planets form just beyond the frost line, their gravity would tend to disrupt a region in such a way that planets can’t form. This is how our own asteroid belt formed (rather than from an exploded planet as some have claimed). The dynamics of planetary formation are complex, and there is still much we don’t understand, but we do know that the type of material making up a body shows the history of its formation. Presence of ammonia on Ceres shows that it must have spend time beyond the ice line. In that way it seems more connected to the outer region of the solar system. Mr.Koberlien Sir.in the reading today you talked about gas giants.what my question is are these giant gas planets like Saturn are they just a giant ball of gas or do they have a surface at all? They don’t really have a surface. Their atmosphere becomes thicker with depth, and eventually it becomes less gas-like and more fluid/solid-like. So if the Earth formed inside the frost line, then where did it’s water come from? It used to be thought that it was from comet impacts, but the deuterium ratio’s don’t match up.